Tomorrow I am going to be 60! How did I get this old? Where did all the time go? I still remember the days when I lived in Brooklyn, when the slogan going around at that time was, “Never trust anyone over 30.” For that reason, my thirtieth birthday was a hard one for me. But it was alleviated by the fact that I spent it on a sailboat out in the Stockholm archipelago. It was my first visit to Sweden. A man named Håkan took me sailing for a week and he gave me a box of chocolate with a picture of Silvia, the Queen of Sweden, on it. That was a great birthday, in spite of my no longer being trustworthy. And that birthday was 30 years ago. I’ve spent 30 years of my life connected to Sweden. And now I sit, out at our country place in Stavsnäs, in the little house that was the original house on the property, typing these words. My husband, the same Håkan from that sailboat ride, and my son are just across the yard in the newer, bigger house we built together. Probably wondering why am I sitting out there and why am I staying up so late. Actually, probably not. My son is sitting peeled to his computer screen and definitely isn’t thinking of me and I can see my husband watching TV. A bunch of friends, most of them part of the “family” that I created here for myself, think I should have a big party to celebrate. A number of them have had big blowout celebrations for their 50th birthdays, recently. (Most of them are younger than me, you see.) But to celebrate what? That I’m not dead yet? I feel sort of dead though. I feel like I’m at some sort of crossroads, with so many different things all tugging at me, trying to pull me in so many different directions. I want to yell STOP! Leave me alone! But life doesn”t do that. All that tugging and pulling is what life is about. A like-aged friend from childhood, told me about a birthday party she recently attended. The theme of the party was “I Am 60 Going on 17”. I love that idea. In a way that’s how I feel – like a teenager all over again. Like during my teenage years, my body is metamorphasing into something I don’t recognize. And its not a good thing, let me tell you. The hair that I used to have to shave off my thighs is gone now. Great you might say but it seems to have moved over to my chin and upper lip. Who asked for that? And when I spent my teenage years waiting for all those new bulges to appear, it seems like they are now appearing but in all the wrong places! But the main similarity with teen years lies in those big questions: Who am I? What do I want to do with the rest of my life? What do I want to be when I grow up (or older?) I’ve given up on the growing up thing. I didn’t want to when I was 10 and I don’t think I want to even now. Some of my friends in my age bracket talk about how they are so looking forward to retirement. But what does that mean? To stop working and spend time playing golf? I hate golf! And to stop working is something I cant imagine. Its like declaring that what I spent my life doing wasn’t worth anything. Maybe if I worked on an assembly line or in the post office sorting mail all day I might want to stop doing that. But what I work at is what I do, its who I am. I want to be able to continue doing it till my hands freeze-up from arthritis or my mind stops working. So imagining retirement doesn’t take up a lot of my time. Other questions do though. What is my role as a mother to my son, now that he doesn’t need me so much? I spent 20 years being a mother. How do you just stop being one? How do I reinvent my couple-ness with my husband? How do we become a twosome again? And then, there is my roll as a daughter to think about. How do I help my mother as she ages? What do I need to do for her? How do I offer my help without making her feel like she is losing her independence and self-reliance? And how do I do it from so far away as I am? Mother, daughter, wife, artist, creator, friend. All of these things are pulling at me, tugging me into the future, putting demands on me to make decisions, to be responsible. But I don’t know what to decide. I don’t know where I’m going.I don’t know what to choose. Who the hell is this person? 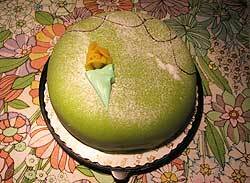 All I know is that I want to eat princesstårta on my birthday. Cake made of layers of whipped cream and yellow cake with light green marzipan smoothly covering it and a yellow marzipan rose on top. That’s what I want for my Birthday – the big six oh. And now its the next day. While I was writing this the clock turned over to June 29. And now I am 60. A new year is fast approaching. That’s a good thing, I guess. A new beginning, new resolutions, a new start. All good things. It also means a new notch on our belt, another year older. I’m still not sure how I feel about that. Here’s something I wrote almost 7 years ago but being that its soon the eve of a new year I thought it appropriate to put it up on my blog now. Something to think about as we cross over that demarcation line that causes 2009 to change over to 2010. Happy New Year everyone! I feel the need to rant a little. I want to start off by making something very clear – this whole thing about aging – I don’t like it, not one bit. I haven’t been feeling so good lately. When I wake up in the morning, just getting my feet over the edge of the bed down to the floor takes an effort. And then I have to stand up! What a job! Walking’s OK, once I manage to bend down to buckle my shoes. I keep hoping that I don’t have to go uphill though. That’s a real bother! When I ride a bus, I generally get up and give my seat to any white haired old lady when there are no seats left. I figure that I have to set a good example for my 12-year-old son. But, I don’t know, they must have done something to those bus seats when I wasn’t looking because they are so hard to get up out of!